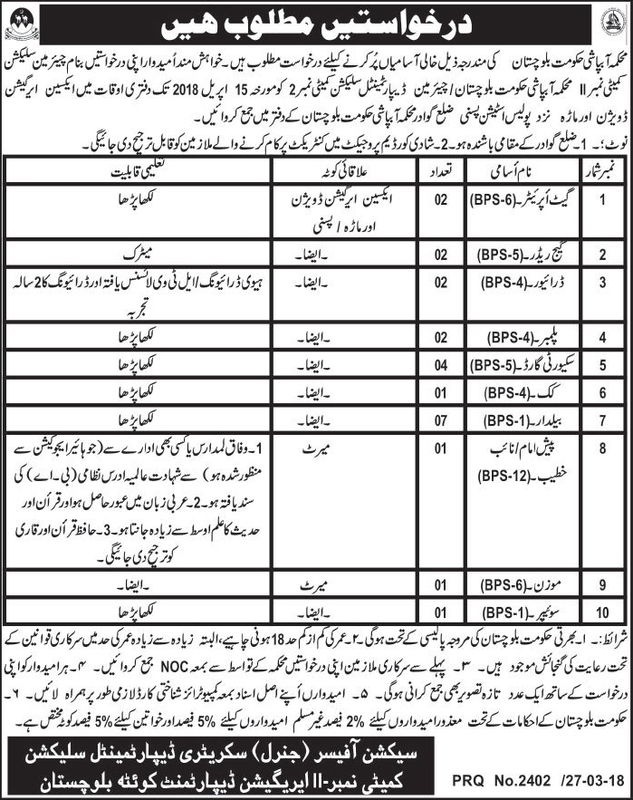 Irrigation Department Government of Balochistan has announced 23 New Jobs in Daily Jang Newspaper 28-03-2018. Interested Candidates can apply for Irrigation Department Jobs 2018 for Gate Operator (BPS-06) 02 Posts, Gauge Reader (BPS-05) 02 Posts, Driver (BPS-04) 02 Posts, Plumber (BPS-04) 02 Posts, Security Guard (BPS-05) 04 Posts, Cook (BPS-04) 01 Post, Baildar (BPS-01) 07 Posts, Khateeb/Imam (BPS-12) 01 Posts, Moazzan (BPS-06) 01 Post and Sweeper (BPS-01) 01 Post. Candidates already serving in Government Department must Attach NOC.05% Quota reserved for Non-Muslim and 02% Women and 02% for Disabled Candidates.